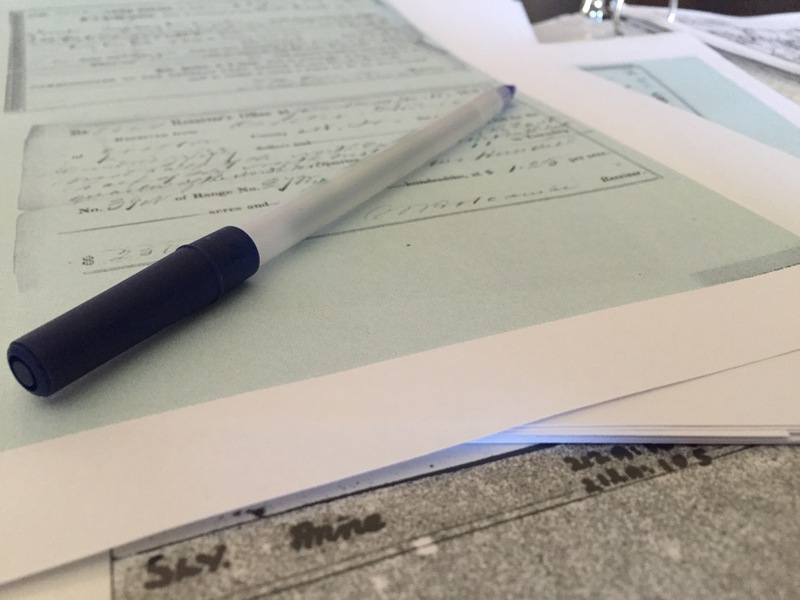 Have you ever attended a genealogical event, conference, institute, or seminar where you had the opportunity to sign up for a personal consultation with the instructor or a professional genealogist? These are sometimes offered at events like a national conference or during week-long institutes. I recently participated in two such events that got me thinking about how to be prepared for such an opportunity. I was on the opposite sides of the desk for each event so I now have perspectives as both the participant and the professional. In September, I attended my first ever course through the British Institute from the International Society for British Genealogy and Family History (ISBGF) [http://isbgfh.org]. I took the course on researching in England. I have done a lot of research in United States records on a particular family line leading back to England, but only recently decided to work on the family in more detail. However, I only have minimal experience in records created and kept in England, hence the need to take this class. One of the unique features of the British Institute is that since it is held in Salt Lake City, the instruction time takes place in the mornings and then the afternoon and evening hours can be spent utilizing what you’ve learned on your own research in the Family History Library. Also during those afternoon hours, you have the opportunity to sit down with the instructor(s) and receive a personal consultation; I had about 20 minutes to ask the instructors anything. In October, I had the opportunity to participate in the “Ancestors Roadshow” giving free 15 minute consultations to members of the public as a part of the “Genealogy Lock-In” hosted by the Central Texas Genealogical Society in Waco, Texas. It was a fantastic event. I met a lot of new people in the Texas genealogical community and had a lot of fun helping a few lucky participants in the roadshow. As part of the roadshow, participants could fill out a questionnaire about research questions or problems they were having and then we (the professionals) were supposed to go over this with them and give suggestions for further research. The participants had the opportunity to fill this sheet out ahead of time. It was made available through a website advertising the service. They could also fill it out at the event and be assigned a time with a professional. From both of these events, I realized that the person coming to the consultation could get so much more out of the short amount of time if they were a little more prepared. During the roadshow, I was handed the questionnaire and introduced to a person and then only had 15 minutes to help them with their questions. Most of the time, the questionnaire would list a person, perhaps their birth or death dates, maybe a location. They were asked to tell us where they had previously searched and/or give us a list of documents they had pertaining to the problem. Most participants didn’t write much down. Many wrote that they had searched Ancestry.com, which is not very specific at all. Ancestry contains a lot of material. When they got to sit across from me at the event, most of them spent a lot of time telling me their story rather than getting very specific about their problem. This took up most of the 15 minutes we had together. I was not much better as a participant when I had a chance to talk to the instructors at the British Institute. Honestly, I had not done much work yet on the family I was researching and should have spent more time analyzing what I had and preparing specific questions for the time I had with them. 1. Decide what you want to ask – be focused. 3. Know what you’ve already done and what documents you already have. 4. Keep the background story to a minimum. Don’t waste your precious time giving unnecessary information. It is up to you to get the most out of the experience. The professional may be doing this as a volunteer (like I did at the roadshow) or as part of their overall fee (like the instructors at British Institute). You can’t expect one of these consultations to just give you the answer to your research problem. The time is too short. These consultations are designed to give participants guidance and maybe some ideas you hadn’t thought of or weren’t aware of. I hope that these thoughts help you if the opportunity ever presents itself. I know I learned a lot about the process from both sides of the consultation table and will definitely be more prepared the next time. You hit the nail on the head, Cari. It is so important to come prepared with precise, focused, and accurate information to present to the consultant. A researcher has been working on the problem for possibly years and the consultant has 15 minutes to spool up on the issue and start developing a research plan.The old adage still holds true, “You get out of it what you put into it.” I look forward to your help, instruction, and consultations at the 2016 British Institute. Thank you Eric! I too am looking forward to working with you at the 2016 British Institute. This is a great post, Cari. You are so right. I have been a consultant at our local genealogy society events, and the ones that were the most successful were the ones who came prepared with specific problems and knew what exactly they had done before. I think the main problem with many who sign up is they don’t really know what they have and what they have done before because they didn’t keep research logs or spent the time to analyze their work. I have hesitated to sign up for consultations because i didn’t have a focused problem to ask. Your list is great and forms for the participants should have these kinds of questions. Exactly how we get people to prepare is the challenge for sure! Good for you for doing the consultations… I found I learned a lot even if I wasn’t terribly helpful to that specific person. Always a great learning experience. Several years back, before I was totally engulfed in genealogy, I happened to be in Boston and visited NEHGS on an Open House day by chance. Only upon visitation did I learn we could visit with their staff. I was totally unprepared. I actually got to meet with two staff persons separately and I was completely unprepared. Only later did I realize I had met with Gary Boyd Roberts and D. Joshua Taylor. Pressured, I pulled a name out of my memory, Sheldon, which is already very well documented. Mostly a waste of time for all of us. Boy, did I miss a huge opportunity! If I had known who I was meeting with, I could have tailored my questions and if I knew what my primary research questions were, I would have had something specific to ask that would have been of value. So now I live for the day when I get to meet them again! I feel your pain! So glad to hear I am not the only one who misses important opportunities sometimes!